365 Marlborough is located on the north side of Marlborough, between Hereford and Massachusetts Avenue, with 363 Marlborough to the east and 369 Marlborough to the west. 365 Marlborough was designed by architect Frederick B. Pope and built in 1887 by William H. Stewart, builder, as the home of Spencer Welles Richardson and his wife, Mary T. (Cumston) Richardson. He is shown as the owner of 365 Marlborough on the original building permit application, dated July 14, 1887, and on the final building inspection report, dated August 13, 1888. Spencer Richardson was a banker and treasurer of the Saco Water Power Machine Shop. The land on which 365 Marlborough was built was part of a larger parcel purchased on June 12, 1868, from the Boston Water Power Company by Daniel Davies, a housewright and carpenter. He and his wife, Amity Bacon (Hastings) Davies, lived at 131 Mt. Vernon until the early 1870s, when they moved to 445 Beacon. 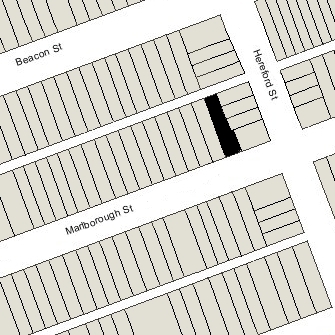 Between March and December of 1872, Daniel Davies sold Silas Whiton Merrill, a building contractor, five lots comprising a parcel at the corner of Marlborough and Hereford, with a frontage of 80 feet on Marlborough. In 1872-1873, Silas Merrill built 363 Marlborough and 13-15-17 Hereford on the eastern 60 feet of the parcel. Click here for an index to the deeds for 365 Marlborough, and click here for further information on the land on the north side of Marlborough between Hereford and Massachusetts Avenue. 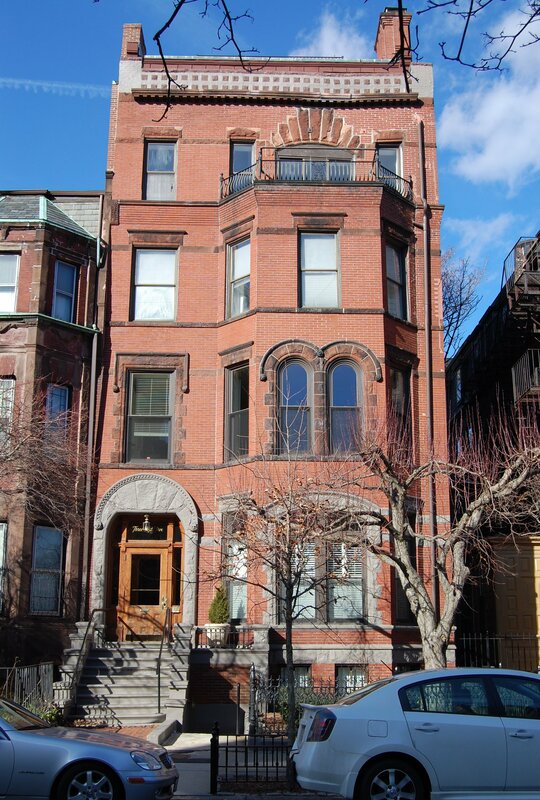 On May 26, 1874, Mary Richardson purchased 363 Marlborough from Silas Merrill, and she and her husband made it their home. At the time, she also purchased the lot to the west, with a 20 foot frontage, from Silas Merrill. They left the lot vacant. Six years later, on October 20, 1880, Mary Richardson bought a strip of land 4 feet wide to the west of the still-vacant lot from George Wheatland, Sr., of Salem, the father of building contractor George Wheatland, Jr. It was part of a larger parcel George Wheatland, Jr., had purchased from Daniel Davies on May 10, 1872. and subsequently sold to his father. After another six and a half years, the Richardsons had 365 Marlborough built. In building their new home, the Richardsons transferred a strip 4 feet wide and 44-1/2 feet deep from the west edge of their lot at 363 Marlborough; as a result, the lot at 365 Marlborough is 28 feet wide on Marlborough but only 24 feet wide at the alley. The Richardsons’ former home had originally been numbered 365 Marlborough and the lot where their new home was built had been numbered 367 Marlborough. When the new house was completed, it was numbered 365 Marlborough and their former home was renumbered 363 Marlborough. Mary Richardson died in February of 1890. Spencer Richardson continued to live at 365 Marlborough. Their unmarried sons — William Cumston Richardson, Spencer Cumston Richardson, and Amor Hollingsworth Richardson– lived with him. By the 1892-1893 winter season, Eliza W. B. (Chapman) Rogers, the widow of Charles Rogers, also lived at 365 Marlborough. She continued to live with Spencer Richardson and his sons during the 1893-1894 season. For the next four seasons, Spencer Richardson, his sons, and Mrs. Rogers were living elsewhere and 365 Marlborough was the home of Mary (Fenton) White, the widow of Jean White. Their eight unmarried daughters — Susan, Fanny, Elizabeth, Grace, Florence, Edna, Ruth, and Agnes — probably lived with her. They previously had lived at 7 Gloucester. Jean White had been a musician and music publisher. After his death in February of 1884, Mary White continued to operate his publishing company until 1908, when it was purchased by Carl Fischer. She continued to live at 365 Marlborough until about 1898, but had moved to 877 Beacon by 1899. By the 1888-1899 winter season, 365 Marlborough was once again Spencer W. Richardson’s home. His sons, Spencer and Amor, continued to live with him, as did Mrs. Rogers. Spencer and Amor Richardson later became coffee growers in Matagalpa, Nicaragua. Eliza Rogers died in June of 1900. 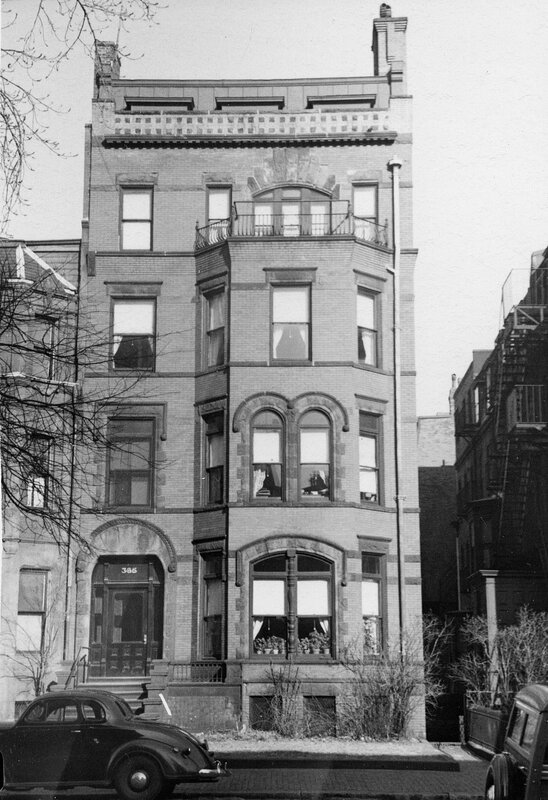 Spencer Richardson and his sons, Spencer and Amor, continued to live at 365 Marlborough until about 1906, but moved thereafter to 826 Beacon. On March 31, 1906, 365 Marlborough was purchased from the Richardson family by Lucy (Bowditch) Stone, the wife of Richard Stone, a lawyer. They previously had lived at 18 Chestnut. They also maintained a home in Manchester. Richard Stone died in August of 1914. 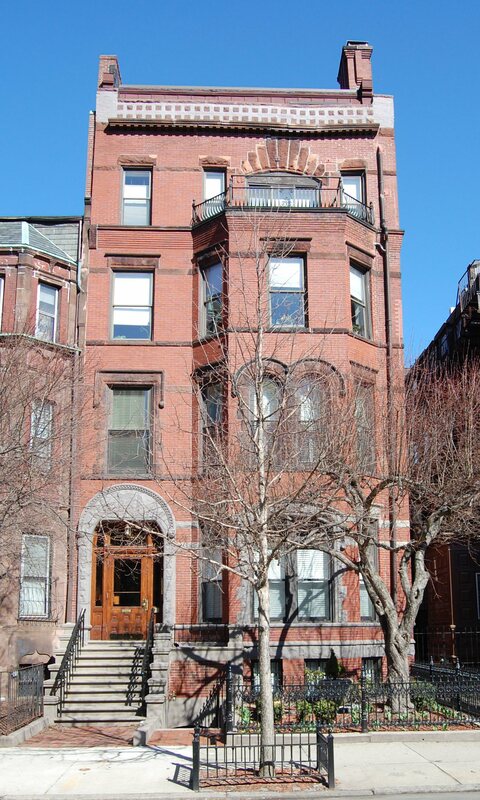 Lucy Stone and their unmarried children, Mary Gray Stone and Ingersoll Bowditch Stone, continued to live at 365 Marlborough during the 1916-1917 season, but moved thereafter to Brookline (where Lucy Stone was living at the time of her death in July of 1918). The house was not listed in the 1918-1921 Blue Books. On May 31, 1921, 365 Marlborough was acquired from the estate of Lucy Stone by real estate dealer William J. Stober, and the next day he transferred it to Leonie (Dueth) Barry, the wife of William Barry. She operated the property as a lodging house. William Barry was a tailor and Leonie Barry was a former actress. They lived at 125 Commonwealth, where they also operated a lodging house. William Barry died in March of 1924. In about 1924, the Barrys expanded their lodging house at 125 Commonwealth to include 127 Commonwealth, and at about the same time they converted 365 Marlborough into a dormitory. Many of the residents of 365 Marlborough moved to 127 Commonwealth. By 1924, 365 Marlborough was the sorority house for the Zeta Phi Eta Sorority of Emerson College, which remained there until about 1926. It previously had been located at 16 Exeter (196 Marlborough). By 1927 it had become Southwick Hall Dormitory. On June 11, 1928, 365 Marlborough was acquired from Leonie Barry by Kenmore Dormitory, Inc., and it became Kenmore Dormitory, operated by Mrs. Gertrude R. (Loewy) Hydeman, widow of Ernest N. Hydeman. She previously had lived at 471 Commonwealth. On September 14, 1933, Kenmore Dormitory, Inc., transferred 365 Marlborough back to Leonie Barry, and Gertrude Hydeman and the Kenmore Dormitory moved to 521 Beacon. Leonie Barry continued to operate it as a lodging house and dormitory, the Marlborough Students House. On August 24, 1943, the Massachusetts Hospital Life Insurance Company foreclosed on its mortgage that the Barrys had obtained when they purchased the house in 1921. On September 1, 1943, 365 Marlborough was acquired from the Massachusetts Hospital Life Insurance Company by George Emules LeTendre and his wife, Rose (Sylva) LeTendre, who operated it as a lodging house. They lived at 338 Marlborough, where they operated another lodging house. They also operated lodging houses at 336 Commonwealth, 364 Marlborough, and 395 Marlborough. By 1945, the LeTendres had moved to 365 Marlborough. They continued continued to live there and operate it as a lodging house 1946. On September 30, 1946, 365 Marlborough was acquired from the LeTendres by Herbert Johnson Downs, a postal clerk, and his wife, Lettie (Letricia) Irene (Reed) Downs. They lived in Roxbury. On February 28, 1947, 365 Marlborough was acquired from Herbert and Lettie Downs by real estate dealers George D. Manos and Edward I. Kaplan. In June of 1947, George Manos applied for permission to legalize the occupancy as ten apartments (eleven apartments was written in and then crossed off). He subsequently abandoned the permit. However, starting in 1947, ten residents were listed in the City Directory as living at 365 Marlborough. The property changed hands and on March 22, 1956, was acquired by Ralph E. LeBlanc. In March of 1957, he applied for (and subsequently received) permission to legalize the occupancy as eleven apartments, which he stated had been the existing condition since 1947. On May 8, 1978, the Granite Cooperative Bank foreclosed on its mortgage to Alcon Realty Trust and took possession of the property. On September 22, 1978, Keith Gordon and Roger J. F. Lehrberg purchased 365 Marlborough from the Granite Cooperative Bank. In July of 1979, they applied for (and subsequently received) permission to convert the property from eleven apartments to six apartments. 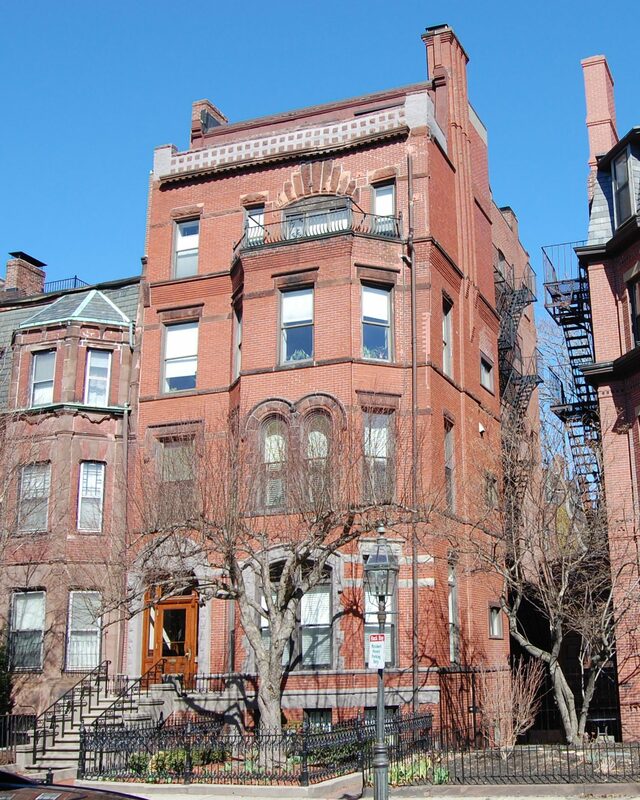 On January 11, 1980, they converted the property into six condominium units, the 365 Marlborough Street Condominium.